Our family doesn’t celebrate Christmas, but we do celebrate cookies, which are as ubiquitous during the Christmas season as doughnuts during Hanukkah and matzo balls during Passover. Every December I make a load of cookies. I give most of them away as gifts, but of course, keep (in the freezer) a container or two of family favorites for us. Depending on how much time I have, I make these oldies but goodies: Fannies, Grand Finale cookies, Dutch butter-almond cookies, peanut butter cookies, lemon bars, cheesecake cookies, Chinese cookies and Orange Marmalade cookies. Last year I added these Fruit Roll cookies, based on my mother’s wonderful “frozen dough” nut roll. They were a big hit, so I’m going to make them again this year. To make the dough: place the flour in the bowl of an electric mixer. Add the butter and beat at low speed for 2-3 minutes or until the mixture is crumbly (you may also do this by hand or using the pulse feature of a food processor). Add the sour cream and mix it in to make a smooth, uniform and slightly sticky dough. Dust the dough with flour, wrap it in plastic and refrigerate for at least 6 hours. To make the filling: Place the dried fruit, raisins, nuts, sugar and cinnamon in a bowl and toss the ingredients to distribute them evenly. Add the marmalade and mix it in to coat all the fruit. To assemble: Lightly grease a baking sheet. Cut the dough into 5 pieces. Working separately with each piece of dough, roll the dough on a floured surface to a rectangle about 12-inches by 6-inches. Place 1/5 of the filling on each rectangle, forming the mixture into a strip along one of the long sides and to within 1/2-inch from the ends of the two short sides. Roll the dough and place each roll, seam side down, on the baking sheet. Refrigerate for at least 30 minutes. Preheat the oven to 350 degrees. Score each roll along the top with a sharp knife at 1-inch intervals. Bake for about 35-40 minutes or until lightly golden. Remove from the oven, let cool, then cut along the score lines. Sometimes I think life is a bunch of holidays with not much in between. Except for the entire month of January. I suppose that's a good thing, because holidays are happy and celebratory. Also, there's the food. Except for Yom Kippur, every holiday has food. And even when it comes to Yom Kippur, there's the break-the-fast when it's all over and the break-the-fast is all about food. As far as holidays go, at this point of the year, we've just finished Thanksgiving. So what’s next up? Hanukkah is a really delicious holiday. Lots of fried stuff like latkes and doughnuts. It's also a dairy holiday because of the story of Judith, which you can read about it here. For our family, in honor of Judith, I make lots of dairy items in addition to the usual potato latkes and doughnuts. I have served cheese latkes and potato latkes with a yogurt based sauce laced with lemongrass. And also Potato Galette with Caramelized Onions and Cheese and Almond Crusted Winter Squash and Noodle Kugel (actually that one’s a favorite). Desserts? Maybe Meyer Lemon Yogurt Pie (you can use regular lemons) or Baked Goat Cheese with Honey Sauce and Cranberries. Maybe even cheesecake. Or some fabulous cheesecake cookies! 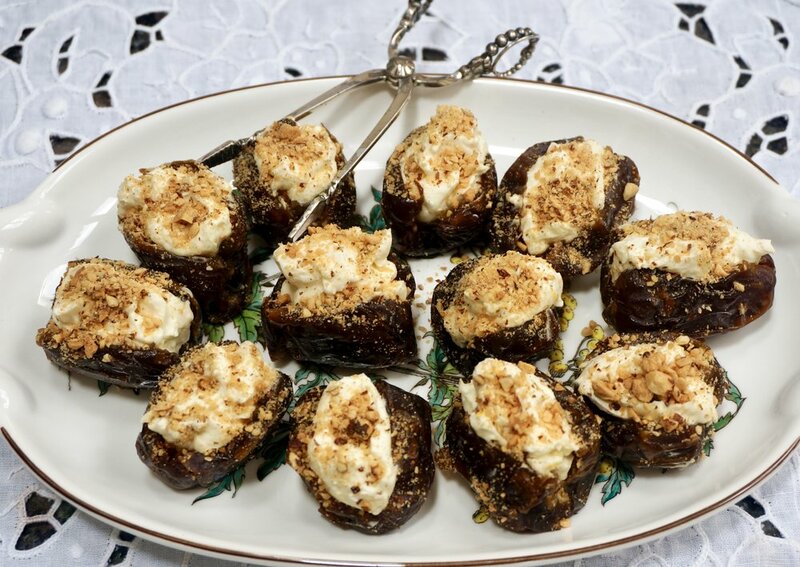 And also these stuffed dates! Easy to make, not too sweet (no added sugar), these little morsels are perfect for the holiday. If you don't want to use almonds for garnish, crushed, toasted coconut will do nicely. Btw, these make a nice tidbit for New Year’s, either as hors d’oeuvre or late night snack. Cut the dates through the center, but not all the way through to the bottom. Remove the pit and spread the date slightly to form a hollow for filling. Mix the cream cheese, yogurt, orange peel and vanilla extract in a small bowl until the mixture is smooth and soft. Fill the dates with the cheese mixture. Sprinkle with the nuts. But how about cheese pie? Tart? This recipe started with a nut streusel top but I needed something nut-free, so substituted shredded coconut. You can change that to chopped almonds if you prefer. You need to start ahead on this one so that the cheese can drain and become dry-ish. This gives the filling a tender texture and also helps assure the crust won't get too soggy too soon. Place the ricotta cheese in a strainer set over a bowl and refrigerate for at least 8 hours, to drain as much liquid as possible from the cheese. Pace the drained cheese in a food processor bowl. Add the eggs, honey, citrus peel and cinnamon and process until the ingredients are well blended and smooth. Set aside while you make the crust. Place the flour in a bowl. Mix in the sugar, salt and citrus peel. Pour in the melted butter and mix the ingredients to form a soft dough. Press the dough onto the bottom and sides of a 9-inch tart pan. Refrigerate for at least 30 minutes. Prick the dough with the tines of a fork. Preheat the oven to 400 degrees. Line the dough with aluminum foil and weight it down with pie weights. Bake for 10 minutes. Remove the aluminum foil and weights, turn the oven heat down to 375 degrees and bake the crust for another 12-15 minutes or until golden brown. Spoon the filling in baked crust and sprinkle the coconut over top. Bake for about 25 minutes or until crispy looking and the center is set. Serve slightly chilled or at room temperature. Sometimes I think life is a bunch of holidays with not much in between, except for the entire month of January. I suppose that's a good thing, because holidays are happy and celebratory. Also, there's the food. Except for Yom Kippur, every holiday has food. And even when it comes to Yom Kippur, there's the break-the-fast when it's all over and the break-the-fast is all about food. As far as holidays go, at this point of the year, we've just finished Thanksgiving. Next up? Hanukkah! It's also a dairy holiday because of the story of Judith. You can read all about it here. So for me, in honor of Judith, in addition to the usual potato latkes and doughnuts, I have served cheese latkes and potato latkes with a yogurt based sauce laced with lemongrass. Potato Galette with Caramelized Onions and Cheese has been on my Hanukkah menu and also Almond Crusted Winter Squash and Noodle Kugel. Desserts? I could go with Meyer Lemon Yogurt Pie (you can use regular lemons) or maybe Baked Goat Cheese with Honey Sauce and Cranberries. Maybe even cheesecake. Or some fabulous cheesecake cookies! Cut the dates through the center, but not all the way through to the bottom. Remove the pit and spread the date slightly to form a hollow for filling. Mix the cram cheese, yogurt, orange peel and vanilla extract in a small bowl until the mixture is smooth and soft. Fill the dates with the cheese mixture. Sprinkle with the nuts. We never have a traditional smoked fish break-the-fast because one of my daughters is allergic to fish. Instead, we have a vegetarian-dairy feast. My friend Susan brings her famous, not-to-be-missed kugel. Another friend brings dessert, although I usually also make rugelach. The rest is up to me. For years I've served Mujadarah, either made with brown rice or bulgur wheat. Other usuals are Spinach Pie, a tomato salad of some sort, egg salad and hummus. But this year I'm not doing the Spinach Pie. No particular reason other than it's time for a change. But not a huge change. I decided to make Spinach Gnocchi. It's already in the freezer, ready-to-bake. Butter a baking dish. Squeeze the spinach to extract as much liquid as possible. Place the olive oil and butter in a sauté pan over medium heat. When the butter has melted and looks foamy, add the onion. Cook, stirring occasionally for 2-3 minutes, or until softened. Add the spinach and cook for 1-2 minutes. Spoon the spinach mixture into a large bowl and let cool slightly. Add the ricotta cheese and mix thoroughly. Add the flour and mix thoroughly. Add the eggs, the 6 tablespoons Parmesan cheese, salt, pepper and nutmeg. Mix thoroughly to blend the ingredients. Refrigerate for at least one hour. Preheat the oven to 350 degrees. Bring a large pot of salted water to a boil. With floured hands, shape the spinach mixture into balls about 1-1/2-inches in diameter. Gently drop the balls into the water. Keep the water at a simmer. Cook for 6-7 minutes or until the balls rise to the top and look fluffy. Lift the balls with a slotted spoon and place them on paper towels to dry slightly. Place the balls in the buttered baking dish. Drizzle them with melted butter and the 1/2-cup Parmesan cheese. Bake for about 18 minutes or until the cheese is bubbly and lightly crisped. Hanukkah wouldn't be right without latkes. And, while classic potato latkes are my favorite and I once made 200 of them for my sister-in-law and brother's annual holiday party, I also like to cook up different varieties. In addition to fried foods, dairy is also an iconic food for Hanukkah. This one is made with cornmeal and cheddar cheese. Good for breakfast, lunch or as a side dish at a vegetarian meal. Perfect accompaniment to sunnyside eggs, for dipping into runny yolks. Also, versatile. Add chives, scallions, corn kernels, chili peppers. Whatever. Also -- make them ahead and rewarm. Melt the butter and set it aside to cool. In a bowl, mix together the flour, cornmeal, sugar, baking powder and salt. Set aside. In a separate bowl, mix the milk, eggs and cooled melted butter. Pour the milk mixture into the flour mixture, stirring gently. Fold in the cheese. If the mixture seems too thick, stir in more milk. Heat about 1 tablespoon butter in a sauté pan over medium-low heat. When the butter has melted and looks foamy, drop 1/4 cup of the batter per pancake and cook for 2-3 minutes per side or until golden brown. I feel blessed that my children and grandchildren come to stay over at my house in Connecticut for holidays and birthdays and occasionally just to hang out. It reminds me of when I was a kid and visited my grandma -- almost every weekend -- along with practically everyone else in my mother's family (aunts, uncles and cousins). That was back in the day before children had so many other activities. Sure, there were brownies and cub scouts, but back then I never heard of things like soccer or gymnastics. Art classes happened during school hours. The only cooking classes for children took place in your own kitchen if you were lucky to have a Mom like mine who let you patchky around. Weekends were strictly for family activities. I'm not saying one way of life is better than another. One size does not fit all, as they say. And maybe today's kids are better educated or are more well-rounded than we were. But I have wonderful memories of that life. It was good. I got to play with my cousin Leslie every weekend. She and her family lived with our grandma. I also got to eat some of my grandma's wonderful food. I hope that in years to come my grandchildren will feel happy when they recall their visits to Ed and me. And have good memories of some of the favorite foods I cooked when they came. Like Macaroni and Cheese. Apple Pie. Matzo Brei. My grandma also made matzo brei and macaroni and cheese. But one of her signature dishes was blintzes. She filled the blintzes with cheese, the classic, but, as I learned later, most people made the cheese filling sweet, seasoned with vanilla and/or cinnamon. My grandma's cheese-blintz filling was lemony, with just a hint of sugar. Also, because there were so many of us, she had no time to fry them a couple at a time and still have everyone eat at the same time. So she placed the blintzes, seam-side down, on a baking sheet, topped each with a little dab of butter, and baked them until they were golden brown. Me? I still love blintzes lemony and baked. And -- surprise to me! -- so do my grandchildren. Her recipe is below, but the filling instructions give you the option to make the more popular vanilla version (and also how to fry them). Don't worry if the wrappers don't fry into perfect circles -- you're going to roll them and if they're a little off, no one will ever know. To make the wrapper, combine the flour, sugar and salt in a bowl and stir to blend the ingredients. Add the milk and eggs and whisk until the batter is smooth and uniform (you may do this in a food processor). Add more milk if the batter seems too thick (it should be the consistency of heavy cream). Set aside for 30 minutes. Place a small amount of the softened butter in a crepe or omelet pan and place the pan over medium-high heat. When the butter has melted and the foam is beginning to separate, add enough batter to cover the bottom of the pan (for an 8-inch pan it will be 1/4-cup), shaking the pan quickly to spread the batter evenly. Cook for a minute or so or until the bottom is lightly browned. Turn the wrapper over and cook briefly. Remove the wrapper and proceed with the remaining batter, separating the cooked wrappers with aluminum foil or waxed paper. To make the filling, place the cheese, egg, sugar and lemon juice in a bowl and mix thoroughly. Add the lemon peel OR vanilla extract and mix in thoroughly. To fill each wrapper: use the first fried side as the inside of the blintz. Use about 2 tablespoons of filling for an 8-inch wrapper and place the filling in the center of the wrapper. Fold the bottom side up, over the filling. Fold the left side, then the right side over the filling, then roll up to enclose the filling. Fry the blintzes seam side down first over medium heat (using the same method as for frying the wrappers – let the butter melt and become foamy). Or, you can bake the filled blintzes: Preheat the oven to 350 degrees. Place the blintzes in a single layer on a jelly roll pan, top each with a tiny piece of butter. Bake for about 10 minutes. I've always been more of an hors d'oeuvre person than a dessert person. So, given the choice (if I HAD to choose) of franks-in-blankets or potato puffs versus chocolate cake, it would definitely be the franks-and-potatoes for me. This does not mean I am immune to dessert and during Hanukkah I do love to get my fill of sufganiyot, especially the tiny fried choux puffs that I make with a bit of sugar and lemon. And also a jelly doughnut or two. Or three. But, I am who I am, so this year I decided to make savory sufganiyot. Can that really be a thing? Anyway, it went over bigtime at my house. I had thought about serving them with a bourbon before dinner, but it got late and we were hungry so we actually ate these as a side dish with some roasted salmon and broccoli. Either way, for cocktails or with dinner. Place the water and butter in a saucepan and bring to a simmer over medium-high heat. When the butter has melted, add the flour and salt all at once. Stir vigorously with a wooden spoon until the mixture is well blended and begins to come away from the sides of the pan. Remove the pan from the heat and let cool for 2-3 minutes. Beat in the eggs one at a time, blending well after each addition. Mix in the herbs and cheese. Heat about 1-1/2-inches of vegetable oil in a large, deep frying pan over medium-high heat. When the oil is hot enough to make a tiny piece of dough sizzle, drop mounded teaspoons-worth of dough into the pan, cooking about 8 at a time. Move the puffs around using a wooden spoon, for about a minute or until the bottoms are golden brown. Turn the puffs over. Cook another half minute or until golden brown. Lift the puffs out with a large frying basket or other tool onto paper towels. Repeat with the rest of the puffs. When all the puffs have been fried, refry all of them for about one to 1-1/2 minutes, moving them around in the pan with a wooden spoon (alternately, you can fry the puffs, lift them out for 15-20 seconds and put them back in the pan for the second fry, then repeat with the rest). Somehow, even after after a heavy meal, most of us still find room for dessert. Me included! But I don't like feeling overstuffed, so I prefer something lighter, made with fruit, rather than a hunk of cake or pie. I made these roasted pears recently -- the recipe is very easy and only has a few ingredients. It's a perfect finale to a Hanukkah meal, which tends to include lots of rich dairy foods and fried everything. You can make the pears a day ahead and stuff the hollows with whipped cream or ice cream, just before serving. For us, the big Hanukkah meal is always a roasted goose with all the trimmings -- braised red cabbage, potato latkes -- the works! Roasted pears for dessert, for sure! Plain. Maybe with sorbet.